At an anti-Israel rally in New York, organized by Jews United Against Israel, Rabbi Yisrael Weiss shook hands with Palestinian Razi Khankan, former head of the Council of American-Islamic Relations. This demonstration, and others like it, spring from the belief of these groups that the Jewish nation can only be restored by the Messiah, and that a secular state contradicts Jewish law. They believe that Palestinians should rule the land until the Messiah returns! Yesh Gvul's spokesmen in Israel announced that in addition to Almog, they were filing complaints for war crimes with British courts against eight other senior IDF commanders. Among them are former chief of staff Lt.-Gen. Moshe Ya'alon and current Chief of Staff Lt.-Gen. Dan Halutz. Israel’s extreme leftists have been arguing — without legal merit — since the late 1980s that Israel has no right to defend itself in Judea, Samaria or Gaza. Adopting the baseless Palestinian claims, they say that somehow the fact that the Fourth Geneva Convention states that Israel must protect the rights of non-combatants in these areas means that Israel cannot take military action to secure its nationals and its national interests beyond the 1949 armistice lines. A simple reading of the texts shows this to be untrue. In recent years, these anti-Zionist Israelis have received aid and comfort from such organizations as Amnesty International, Human Rights Watch and the UN in their quest to demonize their country and criminalize its right to self-defence. Fabricating the laws of war from whole cloth to advance their political agendas, these organizations have given the weight of law to legally meaningless UN General Assembly resolutions and human rights reports. Assigning legal power to these political groups, the extreme Left in Israel has created a fiction which many American jurists refer to today as "lawfare" or the exploitation of the rhetoric of international law to prosecute a political war against a state to politically deny it of its legal right to defend itself. Yesh Gvul is arguably a criminal organization, since it has been running public campaigns to convince soldiers to refuse to serve in the IDF, which his is a criminal offence. And yet, the State Prosecutor's Office has refused to open any investigation against its members. This is not surprising because for years now, the state prosecution has been led by men and women — many of whom are now Supreme Court justices — who sympathize with the views of those waging "lawfare" against Israel. An opinion written by Supreme Court President Aharon Barak determined that the International Court of Justice's advisory opinion last summer on the legality of the security fence should be given legal weight. In fact there is no basis in Israeli law for giving legal weight to an advisory opinion from a politicized external court of (anti-Israel) justices. The battle being launched in the British courts has nothing to do with law. It is simply part of the political campaign against Israel, waged as a complement to the Palestinian terrorists on the ground. Israel is faced with an increasingly dangerous situation. Without a concerted international and domestic campaign to defend its rights, Israel will find itself without the means to justify its right to survive. The socialist/secular tendency obviously has difficulty comprehending the hand of God in the rebirth of the State of Israel and in its continued existence. For this reason, the politicians tend to seek solutions which the world would see as being wise or expedient, rather than the acts of faith which the world can not understand. Israel's form of proportional representation does not produce strong governments, as any leader will have to compromise with any group that may hold a balance of power in the manoeuvrings of government. This can be seen in operation, day by day. One expert on Israel's politics remarked that Israelis are very clever people but are a stupid nation. He was referring to Israel's history of giving concessions and territory to enemies without even being asked, and without any guarantee of security or peace in return. He observed that policies are formulated with a view to who will be leader in six months rather than national security in a few year's time. There are academics who associate with the Palestinian Ecumenical Liberation Theology movement, Sabeel. One such is Professor Marc Ellis of Baylor University in Texas, where some have described him as a token Jew. (Baylor is a Baptist university) During a Summer 2005 series of conferences in North America he shared the platform with Palestinians who recycled assorted anti-Semitism and variants of the "Blood Libel" against Israel. Ellis, who described himself as an "outrageous Jew", compared Israel to Nazi Germany and showed photographs of the ark that holds the Torah and Torah scrolls (two of Judaism's holiest objects) both defaced by superimposed images of Apache helicopters. There is a small group of Israeli historians who have the goal of re-examining the history of Zionism using government documents which have become available since the 1980s. The most prominent members are Benny Morris, Ilan Pappe and Avi Shlaim. Whatever the motives of these historians, the work of Ilan Pappe appears to provide a major weapon in the arsenal of organisations that hate and campaign against Israel, so some examination of his background and work seems to be called for. Ilan Pappe is a Marxist, who refuses to acknowledge the meaning or purposes that Zionism was created to address, ie the needs and rights of Jews to dwell secure in their ancient homeland - or any homeland. Pappe claims that all who attack the Zionist idea are silenced by Israel, but somehow he continues in post as a tenured professor in an Israeli university and is allowed to propagate his ideas to the detriment of Israel. Pappe's methods are criticised by respected historians, as he dismisses the legitimacy of historical facts and rewrites history to support his ideologically determined agenda. He has admitted to the predominance of the Marxist worldview in defining conclusions and outcomes, by asserting that, "we do [historiographically] because of ideological reasons, not because we are truth seekers." Colleague Benny Morris remarked of Pappe's latest book that, "Anyone interested in the real history of the Palestine/Israel conflict would do well to run vigorously in the opposite direction!" Pappe is widely regarded as an advocate of Israel's destruction, since his recipe for a "multinational democratic state" conforms to a PLO formula, which would result in the immediate and complete destruction of Israel. One criticism (by Anita Shapira) of the "new historians" concerns their almost exclusive reliance on Israeli documentation. While this might sound like a bias in favour of Israel, actually it means all every honest admission of fault, contingency plan or extreme suggestion by Israeli planners is used as conclusive evidence of the Zionist plans for expansion. Arab sources are not searched for comparable incriminating evidence. Binyamin Netanyahu's website has a collection of useful articles on the use and abuse of "history" to fuel the arguments about Israel's behaviour and the actual course of the conflict that started long before 1948. We are accustomed to the nations of the world applying a more stringent standard to Israel than they do to Israel's enemies or to themselves, but it is strange to observe how Israel is willing to judge itself more harshly than its enemies. It appears that Israel is striving to conduct its struggle for survival to a higher moral code than it expects from its Arab neighbours or from the rest of the world. Opponents of Israel will cite isolated failings of individuals or groups of Jews sometime in history as evidence that the whole Nation is no better or more deserving than Arab nations who are waging a ruthless terror war against Israeli women and children today. The Arab village of Deir Yassin and the massacre that occurred there are used against Israel in order to discredit and delegitimize the state and the people. There is a web site devoted to the memory of Deir Yassin, which might be expected to be a virulent an damming tirade against Israel. In fact, it appears to be measured and balanced in its analysis of the events. There appears to be no dispute that the residents of the village were massacred during a regrettable and chaotic chapter of the 1948 conflict, as uncoordinated Jewish fighting units fought to keep open the route to the besieged city of Jerusalem. There seems, rightly, to be no attempt by Israel to justify the events in that village, but perhaps they should be put in context. The conflict at this time was between Jewish and Arab guerrilla units which were attempting to secure their position as the British pulled out of the Mandate under which they had been responsible for maintaining peace and an agreed allocation of territory. During this violence dozens of, non Zionist, religious Jews in Hebron had been massacred ( ending the Jewish presence there) and hundreds of Jews had died in other Arab raids and terror attacks. Incidents such as the ambush by Arab villagers of a Haganah convoy from the Gush Etzion settlement were also widely known. Thirty six fighters were killed, some of them wounded and deliberately executed, and the Red Cross delegate discovered that, "their heads and sexual organs [had been] carefully mutilated by the Arab fighters. That was the climate in which Deir Yassin happened, and it is in no way indicative of general or official Israeli policy. Haredi Jews who attended Holocaust conference in Tehran expressed support for Ahmadinejad's ideas. According to their representative in Jerusalem: Iran's goal isn't to exterminate Israel, but to take action against Zionism. Neturei Karta representatives sat in the front row at the Holocaust denial conference in Tehran, evoking much anger. "The haredim who attended the conference for investigating the Holocaust in Iran share a common platform with Ahmadinejad when it comes to the so-called myth the Zionist movement created around the Holocaust. 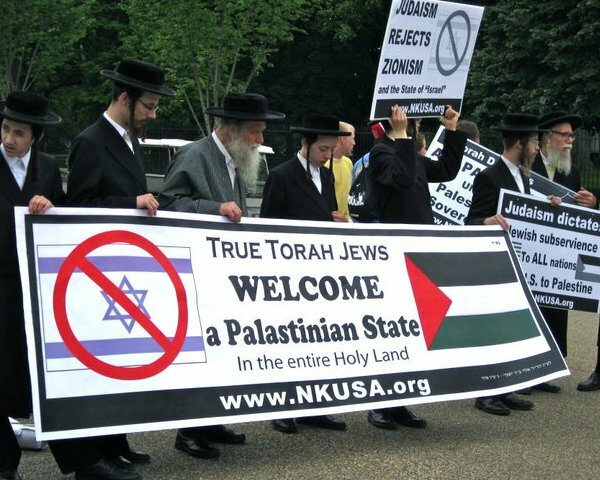 They wanted to make it clear in Tehran that Zionism uses the Holocaust as an excuse for the existence of the Zionist state in the Land of Israel,"
explained Israel Hirsch, a member of Neturei Karta living in the Meah Shaarim neighborhood of Jerusalem. Holocaust survivor and former chief rabbi of Israel, Rav Israel Lau was outraged: "This is something intelligence can't tolerate." From an artice on Y-Net News. Their teaching appears to center on Jewish doctrine concerning the land where they live. Perhaps this statement gives some insight why there are movements within Israel that appear so anti Israel's chances of survival. Apparently, they believe Obama and his plans will bring safety and security to Israel and that standing up to him (and the hostile world) will not. This is a secular, left wing group. One problem is that the output from “Shooting Back” gets more attention internationally than it does in Israel. Thus B’Tselem appears to be working as part of the Palestinian propaganda war aimed at delegitimising Israel and recruiting world powers on side with the Palestinians. They may be using this tactic to shame Israel’s government into action, but is this a valid or a suicidal tactic? The fact that left wing Israelis can do this without intimidation says much for the morality of the Jewish State, but like so much of Israel’s political system such morality and democracy puts the nation at a disadvantage against totalitarian, fiercely focussed bodies that are currently committed to destroying Israel. Another question that one should ask is, how can the supply of camcorders and instruction in their us produce honest results in a culture where demonisation of Israel from kindergarten age is the norm. When the footage is aired around the world, who weighs such factors and considers to what extent the Israelis have been set up or entrapped. A few months after Israel’s Operation Cast Lead in Gaza, yet another slew of unsourced, unverified and unsubstantiated allegations and assertions by unnamed Israeli soldiers claiming appalling acts during Cast Lead was being given pride of place on BBC news bulletins and in the British media, having been supplied by "Breaking the Silence". Breaking the Silence is an NGO into which Britain and other European governments pour funding. See NGOs for the full story. The matter of “Settlers” is one of the most divisive issues within Israeli society. At the time of the Gaza “Disengagement” those who were being removed felt betrayed by the city folks, but they could see no validity in the settler’s case. Settlers see themselves as those faithful to the principles of the founding fathers of Israel who rescued a barren land, but others interpret “Settlers” as some sort of colonialist thugs who are stealing Palestinian land (accepting the Palestinian narrative). Such a gap in perceptions truly sets Israel against Israel. Who is doing the most damage to Israel, the Left that is picking up and running with the Palestinian narrative, or the Settlers who are taking no account of how their actions reflect on Israel on the world stage?